Meticulously Maintained Home In Desirable Three Village Schools. Extremely Spacious With Oversized Rooms Featuring A Custom Gourmet Kitchen With Professional Grade Appliances. One Year Old Oil Burner, Generator Ready, Plenty Of Closets For Storage. Beautiful Paver Driveway. Taxes Are Being Professionally Grieved. 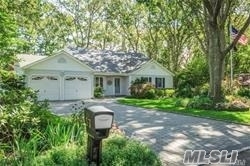 Close To Stonybrook University And Hospital And Shopping.